Then came the second hand Corbin seat, proper bash plate (Guard-It from Adventure Spec) a Scottoiler strapped to the right hand fork leg and a Scorpion exhaust system and James Dean jet kit. Rather unusually for a modern bike – and perhaps betraying the ancient heritage of the DRZ – this actually makes a noticeable difference to the performance of the bike. Many cold, dark, late-night hours in the man cave transformed £8 worth of steel tube into a home made luggage rack based on the original Suzuki parcel-carrier and added both some structural reinforcement to the aluminium rear subframe and support for panniers at the side. Once it had been welded up it was blasted and powder coated silver for a further £12 – probably the best bargain of the entire prep phase. 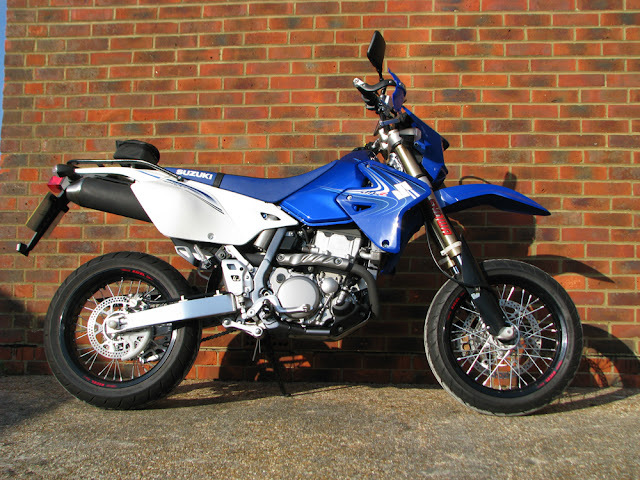 A secondhand set of dirt wheels and a longer sidestand from a DR-Z400S rendered the bike ready for rougher roads, though the larger discs from the SM model were retained to provide more reassuring braking when laden. At the front, twin headlamps from a Buell Lightning fitted with a 35 W HID in the dip beam side provide massively improved lighting, and an MRA highway screen provides shelter from the breeze. A home-made fibreglass front cowl based on the top part of the original Suzuki headlamp cowl mounts to fabricated brackets with quick release fasteners and hides the disorganised mass of electrical gubbins between the two. An Acewell 1100 was added to the dash to provide a rev counter and battery voltage monitoring (a paranoia gained during the Cape Town trip) along with oil temperature monitoring functionality. 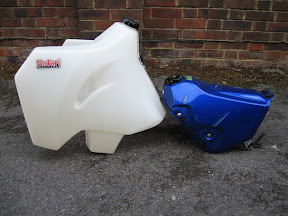 As the stock DRZ battery can be a little marginal, a common mod is to fit a larger unit. Dan was lucky enough to find a tatty but serviceable set of kick-start parts taken from an early DR-Z400K for sale, and fitted the required gearbox parts and lever – and the bike started first kick. The battery was left stock. Ed is poised to point and laugh the first time Dan struggles to kick over a DRZ with a dead battery half way up a Mongolian goat track. Is ur standard tank for sale? I’ve seen a post on HU about the DRZ and I was wondering what your overall experience was with this bike. 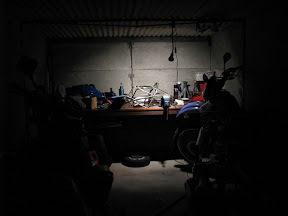 I want to go to Japan and back and I am looking for the “perfect” bike – which I will never find – and I am going mad! This post (http://www.horizonsunlimited.com/hubb/which-bike/how-suzuki-dr400-around-world-58966) says all sort of things about the DRZ, including a change of oil every 1500 miles or so. Was your ride reasonably uncomfortable? Are the vibrations so unbearable? Is it right that you can only do 55 on the motorway? Any help will be a great gift! I can reassure you that there is no such thing as the perfect bike, but thankfully until someone builds the bike that is all things to all overlanders there are a few perfectly acceptable ones we can be making do with. There are all sorts of tin-foil-hat wearing conspiracy theorists out there telling anyone who’ll listen to them that a DRZ’s oil must be changed every 15 miles or 20 minutes whichever comes first but there are also hundreds of thousands of contented owners subjecting their bikes to moderate use (like overlanding) adhering to Suzuki’s 3k mile intervals with good quality oil and suffering no failures. My ride was smooth (with either the OE late-model SM Renthal FatBars or the higher Renthal Twinwalls I fitted), and I found my bike with tatty secondhand Corbin seat pretty comfortable. All things are relative: trailbikes will always be more vibey than goldwings and I’ve done a fair few miles on a touring bicycle fitted with a Brooks saddle – so I’m a fan of the “firm and supportive” ethos of seat construction, not the soft-and-squidgy crowd pleaser. You can do 80 on the autobahn if you want, but it doesn’t feel very pleasant and feels like you’re working the bike hard, which you are (maybe even enough to justify a shorter oil change interval…). Cruising at 70 on the motorway is perfectly possible, but cruising at 60 on A-roads is even further within the performance envelope and hence more fun and less stressful to both dinky-trail-bike and rider. In short, no, the DRZ isn’t perfect, but then again it is cheap, simple, reasonably tough yet light enough to be pretty capable, widely available and has a wide choice of aftermarket adventure bits available for it. Exactly what else is it you need? Hope this helps, and all the best for your trip – should be a belter. You swapped the SM wheels, I’ve been looking for non-SM wheels on ebay with no luck, and trawling thumpertalk for advice. Do you know what wheels are compatible? All the DRZs have the same hubs – so the wheels from any of the off-road versions will fit properly and connect with the speedo-drive on the front spindle. You do then need the speedo-drive from one of the off-road versions to make the speedo read correctly with the larger front wheel. With a bit of patience some dirt wheels will come up – usually plenty for sale in the summer when people in the UK are less focussed on riding their dirt bikes and more on their road bikes… I missed out on a few ebay auctions before I got my set at a price I liked. As for other bikes with the same wheels, I think some of the RMs have similar wheels but without the speedo drive capability. The rear wheel I think is also DRZ specific, though I could be wrong. You could opt for (new) aftermarket wheels (like Talon etc) but for overlanding that doesn’t make a lot of sense – they’re a bit pretty when new and they won’t be by the time you get back! Carbs are rubbish at altitude, and less reliable than fuel injection everywhere! hi, is it possible to fit drz (s) wheels to a (sm) & fit (sm) discs to the (s) hubs without to many problems ?? Absolutely – the hubs are identical, same part number, so no problems at all. The SM discs bolt straight onto the S hubs, and the hubs accept the same spacers and the SM spindles. The S has a different rear spindle, but you need to retain the SM spindle to suit the SM chain adjusters. The SM discs are no problem for overlanding on any dirt roads you can find, and far better on tar roads. If you’re retaining the original Suzuki speedo, you need the S-model speedo drive to suit the larger front wheel, then the SM speedo reads just the same as an S model would. SM speedo drive with S front wheel obviously results in a speedo that under-reads significantly. That DRZ sir is a thing of beauty! It’s providing me great inspiration for the approaching winter evenings. She doesn’t know it yet, but my wife WILL hate you! Will you make me one in black when you get back? This is what I have in mind. I think the SM is very underestimated as an adventure bike. For me personally it is ideal and if funds allow this will be this years winter project. That doesn’t mean the DRZ is not a worthy adventure bike – I still think it is – but I suspect that on this trip we explored the outer limits of what is possible from a durability perspective in one go on a DRZ. After the 22k mile trip it needs quite a freshen up before it’s fit to go on another (though there is a risk I may well do just that…). Just wondered how you are getting on with the Acewell? Do you think the rev counter responsive enough for an early 90’s moto-2 spec CBR600 (no longer running KR364’s on the grounds of safety)!? Also what functions are you using on it? By the way love the pic of the leaning building in your blog… how fast is the wind there? Hey dude – the Acewell itself is good. Fitting the temperature sensor would probably be ok on most bikes, but their hose adaptor is approx 10cm long, so about 5cm longer than the DRZ’s top hose. Hence I bought a sensor to go in place of the crankcase oil drain plug. Other option was do away with the OE temperature warning light switch in the rad, but I wanted to keep that. Rev counter is very responsive, and has a (tiny) adjustable shift light, so in that sense ideal for privateer early-90s Jellymould Moto-2 action. Choose your model based on the range of the bar-graph – my ACE-1100 does 0-10k or 0-20k rpm, which would be annoying if your shift point was, say, at 12k. DRZ seems to like to shift at 8k, so it’s just dandy. I’m using it to display digital volts, digital oil temp and bar-graph revs. On the Moto-1.9 I guess you’d only really need temperature and revs. Based on the effect of the wind on the little DRZ, I’d estimate the prevailing winds to generally be at around 80mph and mostly coming sideways, with gusts of up to Mach 2. 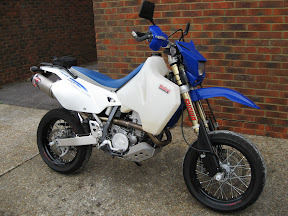 Is it me, or does your modded DRZ bear more than a passing resemblance to your old Africa Twin? ..and before you ask, my armchair is the perfect place from which to judge..
😀 You’re not wrong buddy – it’s a lot like the AT, and not just cos it’s now in trademark white. I even shoe-horned an AT-width rear TKC on there as I was more impressed with the 140-width TKCs we had on the ATs than the small-tread-block 120s they fobbed you off with. It handles just fine and effectively raises the gearing a touch, and I reckon it should last well with only 30hp bothering it.